The year is 1861. At 4:40 a.m. on April 12, Confederate artillery batteries open fire on Fort Sumter. The South Carolina fort, which guards the entrance to Charleston harbor, was bombarded for thirty-three hours with 4000 rounds before the Union troops inside lowered the American flag and surrendered. Thus began the American Civil War. Over the next four years, three million men would take up arms against one another. In many cases, families would be split and loved ones would end up on the same battlefield opposing each other. When it was over, at least 620,000 Americans had lost their lives. There was hardly a family that didn't experience loss. It had truly been a "brothers war." You and up to two other team members will take command of one of the three theaters of operation for the Union or for the Confederacy. Although you have your own armies to command, and generals to oversee, you will need to work closely with your other theater commanders. Together you must decide which generals should command which armies to best take advantage of their unique talents. You must also decide who will control armies as they travel from one theater to another. Will you retain control of an army outside of your theater or relinquish control to your teammate? Each side has it's advantages and disadvantages, so carefully consider your decisions: the fate of the Union and Confederacy hang in the balance. Q. What's the map like? A. It is professionally printed on four 11" x 17" card stock sheets that create a 21" x 32" play area. A tiny square of scotch tape on the bottom side can hold the pieces together nicely. Q. What kind of pieces do I need to provide? A. You can assemble armies out of pieces from many different games. RISK from the 1990's era works well because it includes 40 infantry, 12 cavalry, and 8 artillery, in 6 different colors. Q. Can you tell me more about actual gameplay? A. Sure. 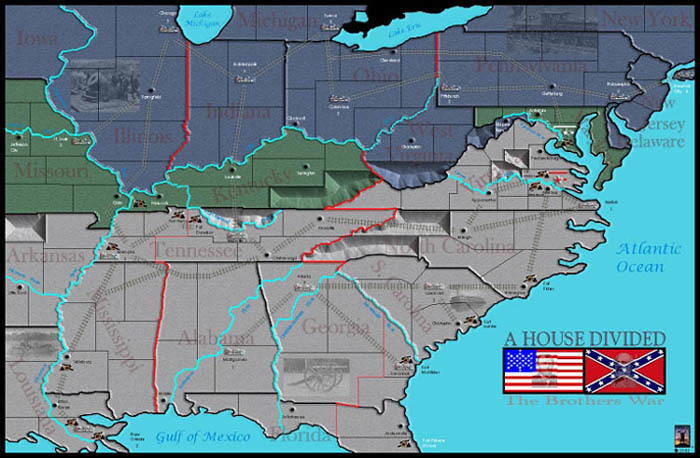 House Divided is a strategic game which pits 2 teams (or players) head to head in a recreation of the Civil War. The goal is to capture your enemy's cities. Accomplishing this goal is not easy for either side as the North has greater production capability, but the South benefits from more talented Generals. Even though House Divided uses RISK-like pieces, it plays similar to other territory based combat round type games like Axis&Allies or Warlords of Europe. Each unit type, Infantry, Cavalry, and Artillery has certain combat values. Generals, represented by cards on the table and corresponding markers on the game board, provide modifications to their army's statistics and provide movement capability for an army when they are in the field rather than in a railed territory. The hand of event cards and General cards are shared by the team. Cards are acquired both at the end of each round of play and at the end of a player turn and if that player has won at least one battle or captured an undefended city. Limited naval warfare is conducted by event cards, Admiral cards, riverboats and forts. Riverboats provide troop transport along waterways. Forts contain inherent troops and help guard waterways. Q. Where does a defeated Confederate general go if Richmond is captured? A. The Confederates must choose a new capitol from any of their recruitment centers. They can only relocate the capitol if it has been captured. Appomattox is NOT adjacent to the mountains to its southwest. The Alabama River end touches the red border of North Carolina creating a small triangular territory south of Chattanooga. Light blue rivers (i.e. state borders) are identical to dark blue rivers in every way other than color. Q. When can Admiral Farragut transport a 1 star general and his troops? A. Only when the Naval Transport is played. Q. Can all my artillery located in the fort territory fire at passing boats? A. No. Only the 1 "fort artillery" can fire, but it is modified by any generals in the territory. Q. Is a boat landing at a fort considered "passing" for the purposes of taking the free round of fire?